The ECO-GATE European Consortium, co-financed by the European Union and led by NEDGIA, the gas distributor of the Naturgy group, presented the ECO-G brand, which has been designed as a unique trademark to rename natural gas for vehicles. In a scenario in which oil-derived fuels are still the majority, the new brand revolves around the idea of “smart ecology”: natural gas is the most suitable environmentally-friendly, economic and current alternative for promoting sustainable mobility, both road as maritime. With a modern design and a lot of personality, the ECO-G brand has a unique typeface that allows it to adapt to the organic shapes of a leaf. The design has been created by the branding consultant Soulman Insightful Thinking, which is also a partner of the European consortium. With this new brand, ECO-GATE aims to unify the different names used for natural gas technology as a fuel source for land and maritime mobility. In this way, ECO-G will function as a denomination seal and the brand can be used by manufacturers of land or maritime vehicles, users of vehicles and technology companies, marketers and distributors in the field of natural gas mobility. ECO-G is a clean technology that reduces to almost zero the polluting emissions that affect air quality in cities: up to 100% of NO2 emissions and more than 95% of solid particles. In addition, it reduces sound emission and vibrations by 50% compared to diesel engines. And if we talk about renewable gas, CO2 emissions are neutral: 100% reduction. 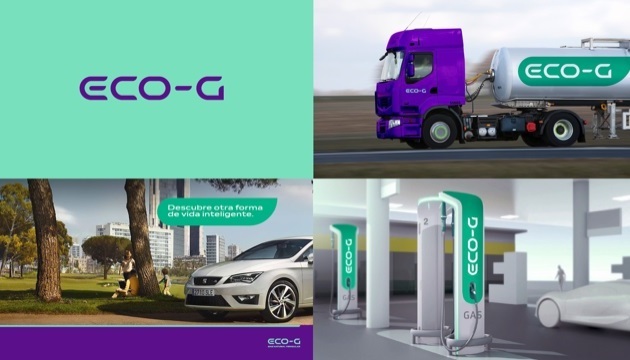 Of all the alternative fuels, ECO-G is the only one that has fully developed and operational solutions for all mobility needs, from passenger cars for urban commutes to long-distance (international) transport, without losing performance levels or autonomy. In addition to environmental benefits, sustainable mobility with natural gas leads to significant fuel savings (50% versus gasoline and 25% against diesel). For example, a light vehicle can travel 275 kilometres on 20 euros of gasoline, 375 Km on diesel and 555 Km on ECO-G.
Its use has been widespread for decades, all over the world, especially in Latin America and Europe. In Italy, for example, there are more than 1 million vehicles and more than 1,100 gas stations, or Germany, with nearly 100,000 vehicles and almost 1,000 gas stations. In Spain, the figures do not stop growing, which demonstrates the great acceptance of mobility with natural gas; in 2018, 5,745 new natural gas vehicles were registered (146% with respect to 2017) and the car fleet exceeded 14,200 units (68% more than the previous year). The European ECO-GATE Consortium (European Corridors for Natural Gas Transport Efficiency) is one of the most ambitious global plans for mobility with conventional and renewable natural gas.